Listen up, I'm talking about Clapham & Brixton Property at the Property Masterclass! For those of you who follow the blog closely will have notice that more and more topics are being addressed thanks to the beauty of interaction. Those not keen to comment publicly can always reply to me via email and receive a personal response. After all, why not make use of my years of knowledge to help you build your property portfolio? Which leads me to the next thing which is even better – a meeting in person. You may be an aspiring landlord, you may be a seasoned developer. All the same you will value the face to face contact. So let’s meet! 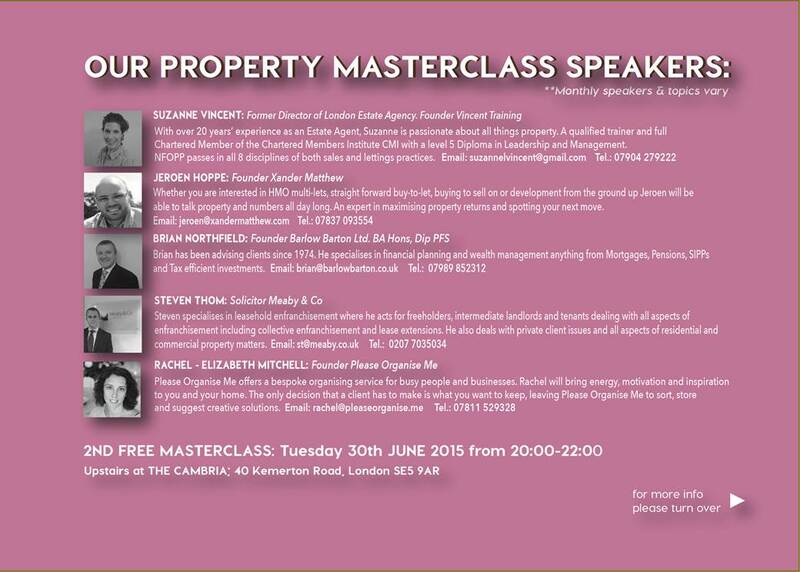 An old colleague and good friend of mine Suzanne Vincent has asked me to speak at her Property Masterclass at the end of this month and I'd like to invite you to come along. There will be a free drink on arrival and a reduced table menu. 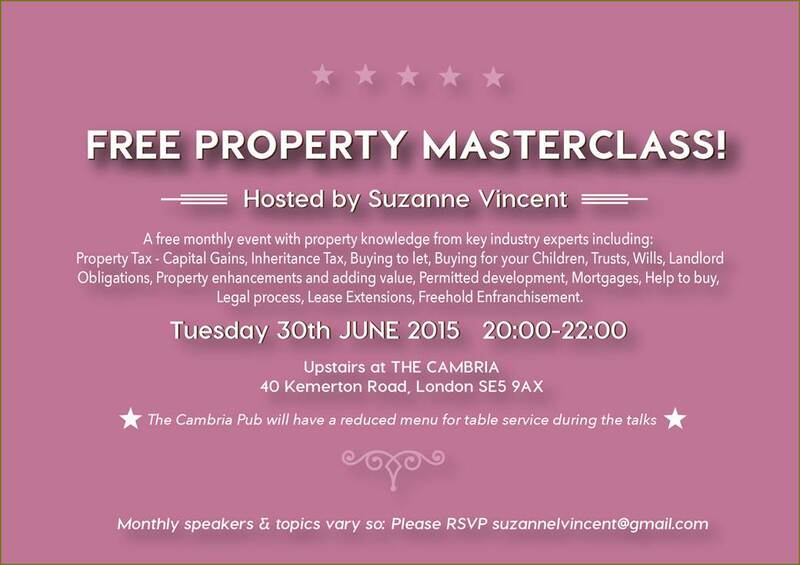 Whether you are a seasoned investor looking to network with local professionals or whether you just want to find out more about investing in property and saving on inheritance tax for your children, there will be something for everybody. A good chance to meet local people, network with like-minded professionals and ask questions relevant to your circumstances. So please join me on Tuesday June 30th 8pm at the Cambria - lovely pub off the beaten track and tucked away in a lovely residential area on the Camberwell/Brixton borders. Loughborough Junction and Brixton are your closest stations and no more than 5/10 mins from those respectively. The food is fantastic and the company will be too for sure. 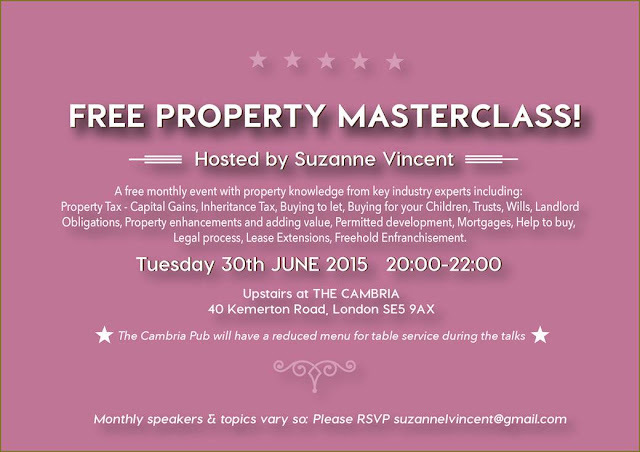 Please RSVP directly to Suzanne so she can organise accordingly on suzannelvincent@gmail.com. If you are looking for a friendly chat about property or the weather by all means give me a call in the office on 020 3397 2099 or drop me a line on jeroen@claphampropertyblog.com.